> Secretary of the Interior Ken Salazar visited the L.A. River this month. Will plentiful federal funding for river revitalization soon follow? > Will Campbell discovers a sweet new city of Burbank bike path along the Burbank Western Wash.
> Here’s a blog about recycled concrete rain gardens I’ve been working on with Koreatown Youth Community Center. 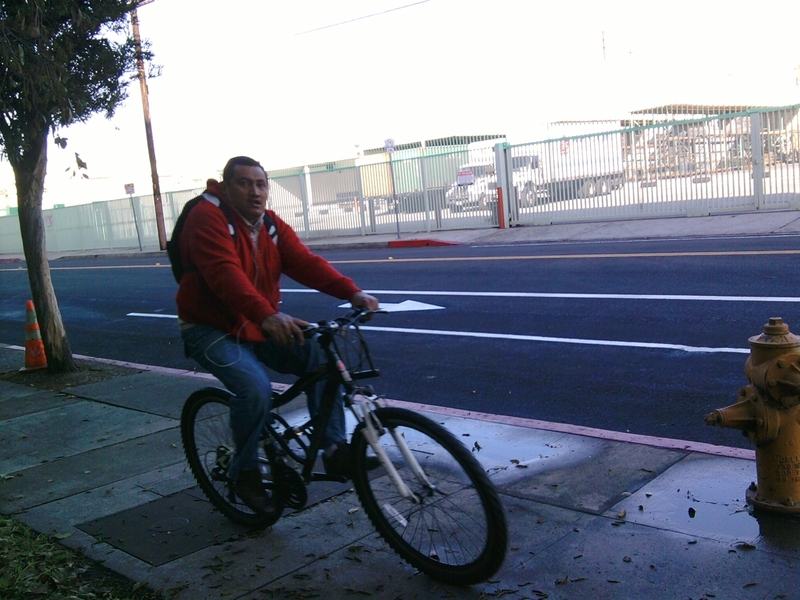 > The L.A. River Bike path bike lane bikeway takes a detour onto the streets of Lincoln Heights. I really really like bike lanes and I like the idea of getting them in first, then moving on to more expensive bike paths… but I fear the massive parking removal on this one here will trigger a backlash… potentially leading to future city reluctance to remove any parking anywhere ever. Even if it’s not quite the L.A. River bikeway, it is a new precedent: the city of Los Angeles’ first completed asymmetric one-way bike lanes couplet… a treatment that I think works better on actual one-way streets. How about Cypress and Avenue 18 next? > Elysian Valley neighbors have been experiencing some pollution issues due to Metrolink operations right across the river at Taylor Yard. Metrolink, So Cal Air Quality Management District, elected officials and the public will meet and discuss how to make the situation better. The meeting takes place TONIGHT – Wednesday January 25, 2012 at 6:30pm at the L.A. River Center, 570 W Avenue 26, L.A. 90065. More information here. > Creek Freak’s Joe Linton will be speaking as part of the environmental media panel at the Council for Watershed Health forum on Tuesday January 31st 2012. More information at CWH website under events. > CicLAvia returns Sunday April 15th 2012, starring the 4th Street Bridge over the L.A. River. New solar lighting (pole on left, with white sandwich board and cone at base) being installed on the L.A. River Bike Path. Glendale-Hyperion Bridge is in the background. 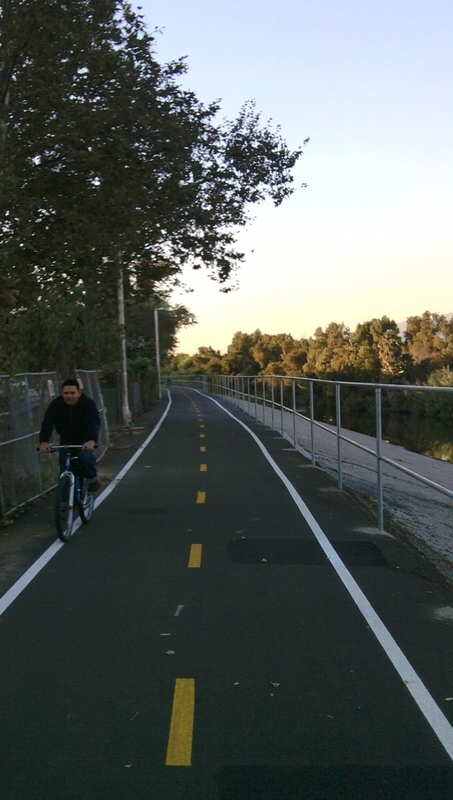 I wrote an article – posted earlier today over at L.A. Streetsblog – about city plans to apply for federal TIGER funding for about five miles of L.A. River bike path, and 20+miles of on-street bike lanes. If it’s funded and completed, it will result in 50+miles of river corridor bikeway from Canoga Park to Long Beach. 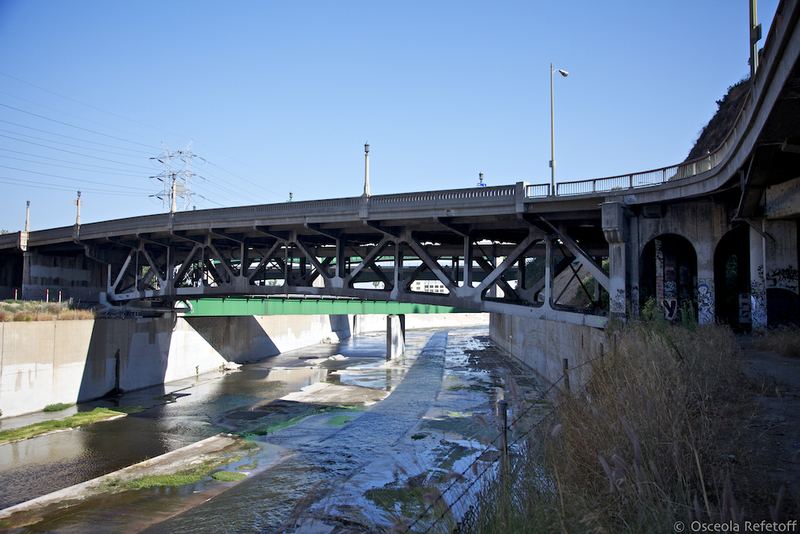 Today’s Los Angeles City Council Transportation Committee meeting includes action on the Transportation Department’s (LADOT’s) proposal to seek $13million in federal funding for extending the Los Angeles River bikeway. The federal funding sought is part of a federal funding opportunity called Transportation Investment Generating Economic Recovery (TIGER), a stimulus funding that encourages innovative and sustainable transportation. Santiago Creek, view downstream just east of the intersection of Chapman Avenue and the 55 Freeway in the city of Orange. 55 Freeway bridge is at the left edge of the photo. Bike path under construction runs along the far (north) side of the creek. My friend Ezra Horne shot and produced this fun short video documenting the December 2011 2010 opening of the L.A. River bike and walk path through Elysian Valley. According to the Eastsider, the multi-use bike and walk path will soon be receiving some new signage designed to foster safer behavior between pedestrians and cyclists. The Coalition for Environmental Health and Justice (CEHAJ) is hosting a bikeathon event on the Lower Los Angeles River on Saturday March 26th 2011. The event’s slogan is “Communities Over Freeways.” The goal is to raise awareness and funding – in opposition to the widening of the 710 Freeway. It’s a fairly short bike ride (about 8 miles) and all on bike path, so almost anyone can do it! Suggested donation is $5. Long Beach starting point: Ocean Boulevard entrance to the LARIO L.A. River Bike Trail – next to the Golden Shore Wetlands, on Golden Shore Drive, just south of where the 710 Freeway crosses under Ocean Boulevard. Both rides meet up in the middle at Coolidge Park in North Long Beach, just south of Artestia Boulevard, on the west side of the river. Full details on the flier here: front / back. Organizers are looking for a few volunteers to assist with basic bike repair duties – if you can help out, email mark [at] cbecal.org. You are currently browsing entries tagged with bicycle at L.A. Creek Freak.